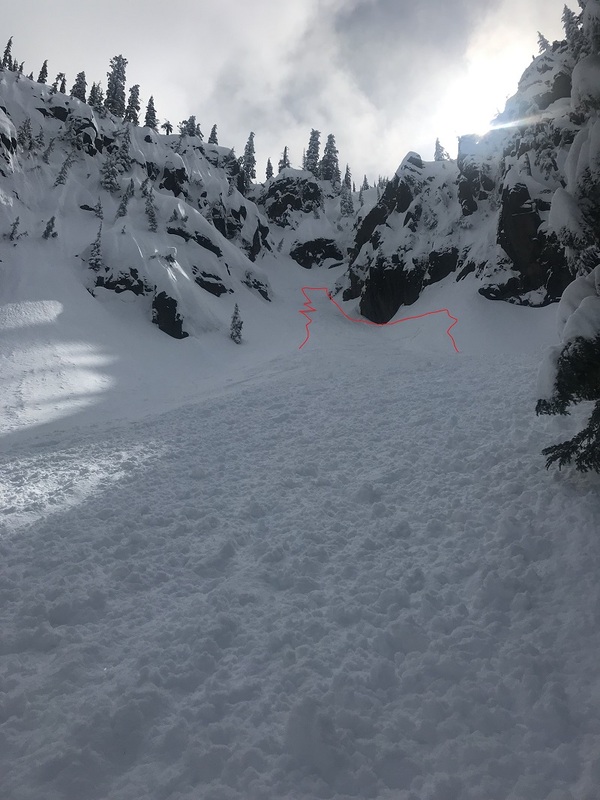 Yesterday, while out on a day off, I triggered a wind slab on this steep, north facing couloir. Immediately as the slab was triggered, I tried to ski off the slab to skiers left, but the slab sympathetically propagated in the same direction. I tried to turn the other way, but by that time I had been caught in the slide. I accelerated quickly down the fall line, engulfed in the debris, sitting on the rear of my skis, feet first. I pulled my airbag pack immediately. It was then I had the time to realize I was going to slam into a grouping of trees. As the slab became loose snow and slid down the slope, I did everything I could to engage my skis on the bed surface below, in an effort to try and avoid the trees. Miraculously and to my surprise, this worked and I was able to ski through the moving debris and shoot out of the avalanche into safe terrain. This was a relatively small slide, but certainly enough snow to take me down the mountain and into undesirable consequences. The crown was about 10-12 inches deep and 75 feet wide in total. This pocket where the avalanche took place doesn't see the light of day and allowed for weak layers to linger...much different than everything else we had been seeing during the day. Prior to the event and in the upper portion of the couloir, minor loose sluffs were observed. Small test slopes along ridgelines resulted in some slab cracking. This area was low enough on the slope that we did not anticipate a wind slab problem. Further, the committing nature of the line discouraged us from hiking back up. Fortunately, I was not buried or injured and walked away from the incident. Circled in red is the location of the avalanche. Below: My turn just before triggering the avalanche. Mostly clear, incoming storm, high clouds.